Let us know what product you are interested in, and a ChemicalInfo Specialist will be in touch to schedule your personalized demo. DWCPDWCP - Find verified global producers with contact details"
What happens after I submit the form to request a demo? 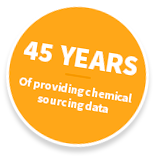 When you request a demo, you will hear back from a ChemicalInfo National Sales Manager within approximately 2 business hours. The sales manager will verify what you are interested in and schedule your demo at a convenient time for you. How long will the demo last? The sales managers customize the demo to fit your schedule, so you will be scheduled for 30 minutes to 1 hour, depending on how much you want to cover and how many questions you have. Can I get a sneak peek before my demo? Yes. Here is a snapshot of a company profile in the DWCP (Directory of World Chemical Producers). We will call you back promptly to review your needs.